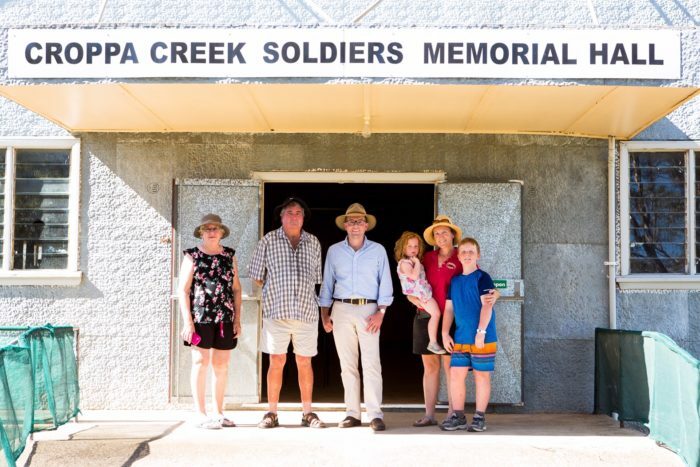 NORTHERN Tablelands MP Adam Marshall has today announced a $50,000 NSW Government grant for a project that will see the gutting of a 60-year-old kitchen and a new modern makeover in the Croppa Creek Soldiers’ Memorial Hall. Mr Marshall said the funding had been secured through the Stronger Country Communities Fund for the hall and for air conditioning to be installed as well. “The hall is a hub for community functions but it is really lacking in modern conveniences, so this project will fix all of that, and make it a much more attractive place for locals to come together,” Mr Marshall said. “The kitchen is a genuine relic of the late 1960s; it’s got an old firewood oven that is ancient and will need a forklift to get it out. “The local school had their presentation night at the hall just before Christmas and with just the fans doing duty it was still very, very hot, so the air con will really bring a blast of good cold air that makes it more comfortable for everyone. Croppa Creek Hall Committee President Wendy Forsyth said the funding was a godsend for a group looking to upgrade the facilities there to attract more events to the venue. “We will be practically gutting the kitchen area, relining it, putting new flooring and putting a deck off two sides of the kitchen so we can install double bifold doors off it that makes it like a canteen area to serve from,” Mrs Forsyth said. Mr Marshall said the project would also deliver new cupboards and benches, including an island bench, new oven, fridge and microwave. “The hall hosts school presentations, bush dances and other fundraisers, and this upgrade will add to its attraction for more events,” Mr Marshall said. Mrs Forsyth said the hall was only licensed to cater for 120 people, but with the upgrades they would be able to cater for 200 people. “It will be a great benefit. We rent the hall out for 21st birthdays and weddings, but with a new kitchen we will be able to get more rent because having a decent kitchen will certainly appeal to people to have their parties here,” she said. The hall was built by the community and opened in 1958 and the community, through the hall committee, has looked after it ever since under the trusteeship of the Gwydir Shire Council.